Most sellers PPC campaigns are in a state of disaster. Why is it that most sellers fail at PPC? Pretty simple. They don’t spend enough time optimizing their Amazon Ad campaigns. On evaluating thousands of Sponsored Ad campaigns, we’ve discovered a strong relationship between account activity and PPC performance. Sellers who actively work on their Ad campaigns almost always see better results. Automation is a good thing, but a bit of human intervention helps accelerate the growth cycle. We know you are short on time. The actual reality is you don’t have to work hours to make a real impact on PPC performance. This optimization workflow is outlined in a way to give equal attention to both your automatic and manual campaigns, as well as transform knowledge from the PPC campaigns into the organic ranking. The optimization process is broken into the Odd week and the Even week optimization. Odd Week Optimization focuses on optimizing automatic campaigns and researching on new keywords for PPC. The first three steps are designed to give a direction to your campaigns and lead the results in the right direction. Make sure you do them right. Irrespective of the number of products you are advertising, understand the goal for each individual product you are advertising. Carefully consider what you are trying to achieve – whether it is to kick off early initial sales, get visibility or target your bottom line profits. Go through the ACoS targets and the strategy for each PPC goal elaborately explained in this article. The foundation of well performing and easily manageable campaigns are the right ad group structures. The more specific your campaigns align to your PPC goals, the better your results will be. So let’s have a look at the best practices for ad group structuring. Pick product functionality as the common denominator, that is group products based on how they function or rather how they are conventionally used. For instance – products like Toilet bowl brush, bench brush, and bathroom brush can’t be grouped together. This is an effective way to control bids and drive traffic to top selling products. Cash cows and dogs represent relative market share. Cash Cows generate consistently high revenue while dogs have a negative cash flow. If you merge the top-selling products and the rest into one ad group and bid higher on the keywords which are common for the whole group, there is no way to control the number of impressions each product gets for a specific set of keywords. Hence, this is a highly effective way of grouping! If there are similar products targeted at different demographics, then it is very likely that the keywords could be different as well. In this case, it is always wise to create individual groups that target different demographics of similar products. Your ACoS is 30%, that is, you are going to spend a maximum of 30% of your sales on advertising. The conversion rate for your product on Amazon is 10%, that is, out of every 10 clicks that your product ad gets, only one of them leads to a conversion. These numbers have to be customized for your ads and the Default bid calculated accordingly. To boost your chances of winning, what you can do further is add another 20-30% to your default bid. By taking a slightly aggressive stance on bidding, you are increasing the chances of landing the keyword that you are looking for. Additionally, by setting your default bid a little over its ideal value, you are providing a buffer against unexpected costs and scenarios that you may incur. Start an Automatic Campaign and leave it running for 2 weeks. Automatic campaigns help discover buyer search terms and identify which keywords work well. Less maintenance and the ability to start and run with the least efforts are also a reason why most sellers favor Automatic Campaigns for a start. 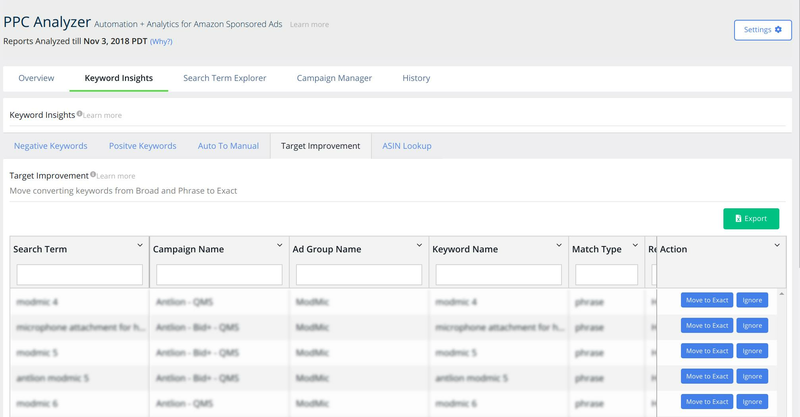 With automatic campaigns, ads are targeted to all relevant customer search terms which are dictated by Amazon. Because these keywords are selected automatically by Amazon, bidding happens at the ad group level and provides very little control. The listing’s title, bullet points, product description, and keywords must be optimized in order for automatic campaigns to run properly. Keywords are selected by Amazon from these areas of your product listing. Monitor the search terms that appear in your Auto Campaign, and identify keywords generating the most orders for your ad, and add them as keywords to Manual Broad Ad Group where these new keywords can be optimized. SellerApp picks up the best keywords from your Automatic Ad Campaigns in your PPC Analyzer Dashboard. The main goal of adding the search terms into the Broad Ad Campaigns is to let Amazon match more search terms to the keyword added. This will help you identify the top performing keywords to exact, where you’ll be able to adjust the individual keyword bid for performance based on the returns. Step 2: For every keyword moved to manual, add the same as a negative keyword in the auto campaign. 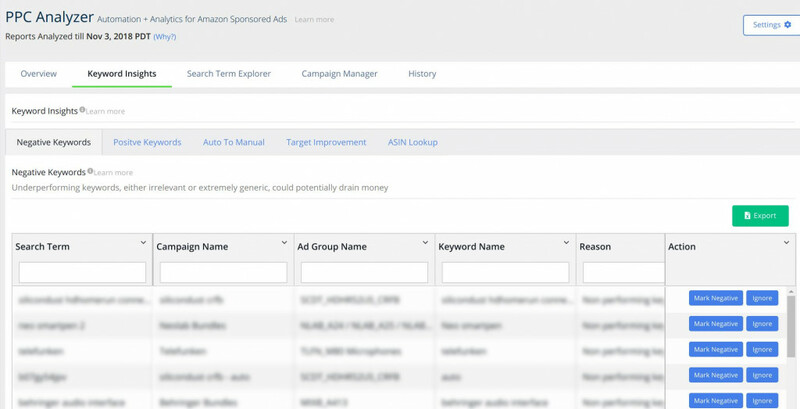 In your Automatic Campaign, you will want to avoid bidding on the keywords running in your Broad Ad Group and the search terms Amazon has matched to each Broad keyword. Make sure that you keep the checkbox ticked, next to ‘Mark Negative’. Thus by adding your Broad keywords to ‘Negative Phrase’ in your Automatic Campaign, you will ensure your Automatic Campaign only matches new customer search terms to your ad that are not already running in your Broad Ad Group. The ASINs in your search term report indicates that your product was shown on the other product’s detail page as Sponsored Ad because Amazon for some reason thinks that your product is associated with the ones in the Search Term report. This can be a good thing or a bad thing, now that you know that how the ASINs are coming in your search report, we’ll see how to leverage this to our benefit in the below article. The title and the product image are the only things a shopper looks at before clicking on to your listing. The title and the product image is, therefore, the foremost factor to drive sales through ad campaigns. If a potential buyer does not click through the ad result then you stand a zero percentage chance of making a sale. Having an optimized thumbnail image showing the product in the best light along with a title that has a quick look into all the information a shopper requires helps. Shoppers relate better to products when the search query entered by them matches the text in your product listing. You guessed it right ! That’s why it is often said to be better to replicate high search keywords in the same order. Once a shopper clicks through the Ad result, the desirability factor of your product listing wins the sale. Have a converting listing leads more shoppers to completing the buying process, decreasing the ACoS percentage. Run your listing through the Listing Quality Checker to ensure that you have the minimal factors to win a sale. Having a Listing Quality Index >80 is often considered to be good. Create a more targeted product listing page. Set a goal to develop at least one more targeted ad group or improve a particular section in every cycle of optimization. The key here is to base bid changes on keyword performance – raise bids on keywords that are performing well, and lower bids on keywords that aren’t making the grade. There’s no real reason to limit budget on keywords that are delivering ROI. Keep an eye on the ACoS, while you increase bids. A high impression rate with low sales rate means you are losing money. The higher the ACoS the lesser your returns. Keywords with good sales rate and a balanced impression rate are the target keywords here. In addition, remember that PPC bid management isn’t a one-time task – you’ll need to optimize bids on a regular basis because keyword performance can improve or degrade over time due to factors outside your control. Look for keyword outliers with above average ACoS. Check your PPC Dashboard to find poorly performing and negative keywords from your campaigns. Refine poor performing keywords with the filters in Search Term Explorer. These are the terms that are costing you money and hurting your results. Longtail yet highly relevant keyword. Decrease the bid and watch the ACOS, while you work on optimizing the listings for the keyword. Check these keywords in the next cycle, if the ACoS is still very high, the best would dump the keyword for now. If the keyword is not entirely relevant, or the ACOS has been very high or absolutely no sales then pause it. By pausing those keywords, you can stop the damage. Remember that broad match provides the widest traffic exposure for your ads, while phrase and exact match are more restrictive but will drive highly relevant traffic. Move keywords to this Ad group only when you are sure that you are driving traffic with the specific search term from the set of keywords. Doing this every week will net you higher click-through rates and Quality Scores over time. You can also use this time to try out new ad extensions, which can further boost your CTR. You can do all this and more with SellerApp’s keyword tools. Use the Keyword Research Tool to identify keyword variations based on the search terms generated in your PPC campaign. Shortlist keywords with high search volume ( >50k ) and high relevancy for Ad campaigns.